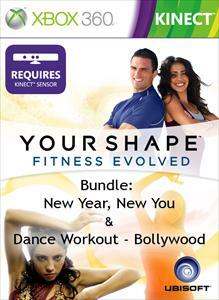 Your Shape: Fitness Evolved - Bundle : New Year, New You + Dance Workout: Bollywood Experience the New Year, New You program that combines cardio, toning and strength moves to give you a full body workout that will help you burn calories and build muscle. And, try the new Bollywood program, a fun dance workout that will keep you smiling as you sweat. Learn the key Bollywood moves and have fun as you dance the pounds away. Double-check before making a purchase. It is possible to download the same content multiple times. Kibocsátás dátuma: 2010. 12. 28.